So you have just recorded your first song in Pro Tools, well done... what next? cmd= E, it's time to mix. Mixing is an important stage in music production as it brings together all of your recorded performances to make a single great sounding and emotive piece of music. Problem is, mixing isn't always that easy, especially for those new to Pro Tools. 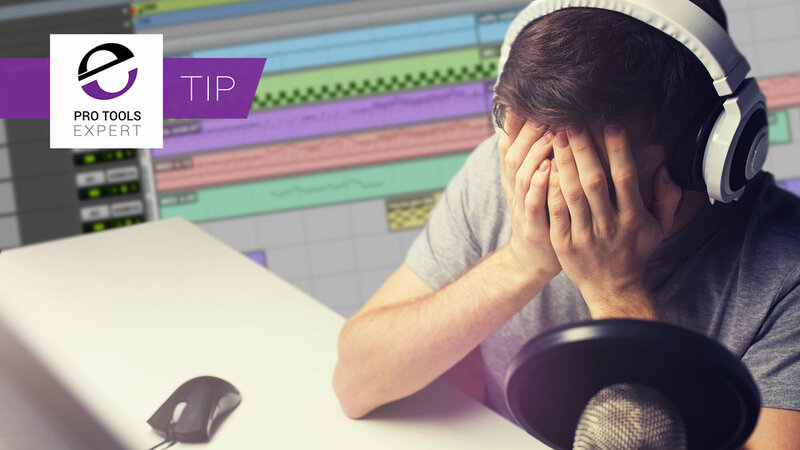 Both are important to listen for when finishing up a mix, but if you are new to mixing in Pro Tools I suggest you don't worry too much about these... at least for now. The main mixing in mono benefit I want to share with you is a far more basic one. Folding the stereo mix output to mono can really help you set static fader levels in early stages of mixing. If your music has a lot of instrument and effects tracks then there's a good chance these tracks will be in stereo (2 channels, left and right), but when we mix our sessions generally have a variety of tracks in mono that sit right up the phantom centre such as lead vocals, kick drums, bass guitars etc. Setting static fader levels when there's a variety of stereo and mono tracks can be challenging as stereo sound (in the width of the soundstage) tickles our ears in ways that mono can't, making it tricky to get a solid sounding balance. By mixing in mono (taking away the stereo-ness from your monitoring) you should find it easier and quicker to set fader levels. Mixing in mono is a great way to perfectly set the level of a lead vocal track in a mix. KISS: short for "Keep it simple stupid". KISS was a vital design principle used by the US Navy in the 60's. The principle states that systems work best when systems are kept simple instead of being complicated. Apply the KISS principle to your mix workflow and there's a strong chance you will get better results from your mixing habits. Try not to use too many plug-ins, try not to overcomplicate automation, instead, try to get as much done with as fewer moves as possible. Keep it simple by applying plug-ins such as compressors and EQs to tracks that actually need dynamic processing and EQ. You would be surprised how often a track really doesn't need any EQ (if recorded well) and how often a track doesn't need compression (distorted electric guitars). While we're on the subject of KISS and plug-ins it's worth mentioning that you should also KISS when it comes to plug-in choices. If you are new to mixing, try to stick to using a small set of plug-ins instead of using everything in the plug-in folder. Use the same compressor plug-in and same EQ plug-in throughout a mix as you'll get the chance to really learn how those two plug-ins work, which in turn benefits your mixes as you'll quickly learn how to get the most out of those plug-ins. Keep it simple stupid - don't be too clever. The key to a producing a great sounding mix is making sure your creative flow is as uninterrupted as possible throughout the mixing process. Stay in the "creative sweet spot" as much as possible when mixing and try to avoid technical obstacles. The creative sweet spot is a place where you solely make tasteful changes to your tracks that benefit the bigger picture... the mix. Creative mix moves include adding effects, EQ, compression, setting levels and panning. Non creative mix moves include loading plug-ins, sorting out timing issues, naming tracks etc. A great way to avoid breaking your creative flow is to prepare, prepare, prepare. Session templates are a great way of setting both yourself and your session up ready to mix. Load plug-ins where you know they will work, even if you end up not using them, is a good habit to get into, mix preparation, on the whole, is a good habit to get into. Make sure tracks are named and coloured. Set up buses and routing... in essence, setup and prepare everything you think you may need and then get to work. By having your plug-ins (tools) at hand you will be free to keep your focus on the job at hand... mixing. Good chefs know that preparation is essential to making good food. They have all their ingredients prepared and kitchen utensils at hand so that they can focus solely on the creative side of cooking. The volume of your monitors will play a very large part in getting your mixes to sound good both in the studio and in consumer playback systems. It's all too easy to crank up the volume of your studio monitors when mixing, but be warned, loud monitors will do a lot of harm to you and your mixes. Loud monitors will fatigue your ears and shorten your concentration span. Personally, I don't buy into the process of setting monitors to a specific loudness, instead, I use good old-fashioned common sense. Before I mix I listen to a track I completed previously that I like the sound of and I set my monitors to an appropriate level which enables me to hear buttons click on my outboard gear and control surface buttons that are placed around my mixing position. Loud monitors can also cause problems with the soundscape. It's difficult to hear the results of compression at loud volumes, if you struggle to hear compressor attack and release times then I recommend you mix quietly as it is much easier to hear a compressor's behaviour at lower monitoring levels. Another benefit of mixing at low levels is it will help you to mix in better punch and clarity. If a mix sounds big and powerful at low monitoring levels then imagine what it will sound like at loud levels. The reverse never works, if you mix loud and want a punchy mix then your ears will fool you into thinking you've achieved the desired effect... then you take the mix out of the studio to reference on a consumer playback system and cry into a pillow. Never forget that every single choice we make in a mix must be made, considered and confirmed with our ears, not our eyes. It's easy to fall into a state commonly referred to as "mixing with our eyes" because plug-ins, meter and waveforms all look so pretty and colourful. Mixing with our eyes is as useful as listening to a Photoshop file... What we see in Pro Tools as well as plug-ins UI do not truly inform us of whatever processes we apply to tracks in a mix. Let's say you are compressing a lead vocal. The plug-in is showing 6dB of gain reduction. An online tutorial may have led you to believe that 6dB of GR is the right thing to do when compressing a lead vocal, so you trust your eyes with that meter reading and your brain informs your ears that 6dB of squash sounds good. What has happened here is an example of mixing with our eyes. If you don't look at the gain reduction meter in a compressor and trust what your ears are telling you over eyes when setting threshold and ratio settings then there's a much higher chance of setting compression to sound more tasteful. You will most likely notice that you are only reducing the vocal by 3dB instead of 6dB and the vocal sounds perfect. Remember, use your ears instead of your eyes when it comes to making decisions in a mix.